You’ve read many of the books or heard much of the “good wife” advice that I’ve heard right? That advice that states that I need to greet my husband at the door each night when he comes home from work looking refreshed and lovely because otherwise I’m not showing my love for him. Apparently I’m supposed to be wearing the sweater he loves (always) and have my hair curled and pretty (at precisely 5:05)…the house is supposed to be clean and if I’m not mistaken, I am supposed to kiss my husband for a full minute (One Mississippi, Two Mississippi…) immediately when he walks in from his hard day at work. I also need to train my children to run in and greet him (what, in the middle of our kiss?!) so that they can show their Daddy how much he means to them. But wait, there are other books that tell me that when a man comes home from work, he needs a good bit of time to wind down before he is to be bothered. He should be allowed to go “into his cave” all by himself with no one to touch him or ask him how his day went and I am certainly not to begin telling him how my day went until he has had exactly 47 minutes (or whatever) alone in his cave and is ready to give me his full attention. I’m not sure if I’m supposed to kiss him in the cave or not. Is it just me, or is there a little bit of contradictory marriage advice out there? And while I think that so many of the aforementioned ideas are great and possibly valid, I can often feel overwhelmed with all of the “good advice” and feel like I just don’t measure up because I can’t do all of those things. I would like to suggest that each of us, as wives, need to look at what our individual husband’s needs and desires are and focus on meeting those needs. My husband personally doesn’t care if my hair is curled and lovely when he walks in the door. (Thank goodness, since as we all know, I rarely have time to curl my hair and you will often find a good bit of flour in the wisps falling into my face.) He actually appreciates the fact that although I do care to keep myself clean and neat (flour in the hair being an exception), I don’t spend much time primping in front of a mirror every day. He doesn’t expect the house to be perfect and he doesn’t really have a cave. He would probably love it if I kissed him for 60 whole seconds (…Twenty-Four Mississippi…) when he walks in the door, but there are usually four loud and excited children who beat me to the door and if all I’m able to do is look up from my biscuit dough with a crooked smile…he still knows I love him. Because I show him in ways that HE needs. It doesn’t matter what all the other husbands need. All that matters to me is what MY husband needs. It’s good to listen to advice from Godly people and to read good Christian books on marriage. There are some fantastic words of wisdom to learn from. But take that advice and communicate with your husband about what he needs from you. 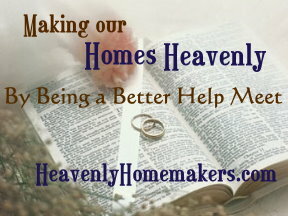 Knowing that you’re doing just what your husband needs feels a whole lot better than trying to meet the needs defined in a book. How about we call it “The Kississippi”? Love that advice! You’re right, there are an awful lot of contradictory messages out there. Yours is spot on. Sometimes it seems as though you read my mind. Scary. Just the other night I told my husband that according to a certain book a “dutiful” wife would do this or that and he laughed. Thanks for the post because you are right; we are all different and communication is what makes a marriage. What a fun post and soooo true too!! Thank you, Laura! Yes, I’m rather tired of all the advice from Christian books and councilors telling me what my husband wants and needs… without asking him. You’re exactly right — stop trying to live up to someone else’s expectations of the “perfect wife”, but just love on your own husband! I think as I read both those snippets of advice in the first part of your post that it makes it sounds as if a husband is such a sensitive creature that we would have to tiptoe around like a mouse and be their for his every whim. This isn’t 30 years ago. It doesn’t work that way. My general when the man gets home is something like this: I make sure I am home, if I go out either with my mom or alone with the kids, I try to time things so I am home when he is. The kids run to, open, or claw at the door when he is spotted. I then enjoy a greeting and kiss and then he goes about ridding himself of his dirty work clothes and hoping into the shower, occasionally the shower waits until he has relaxed a bit and other times it is first. Nothing special. But you won’t see me primping, scrubbing the house, or any other over the top advice just for his return. Amen! I totally agree- it’s about meeting each other’s needs as we both need them to be met. God made us tobe unique and special and that means we won’t fit any mold or any book precisely. BUT, we can take examples and guidances from those relationships we respect and wish to model just like we can learn from those we do not. Great post! What a great post, Laura! There are so many stereotypes out there of “what a man wants” that’s easy to forget that we need to really focus on our own husbands. That is great! So true. I’m going to make a point for hubs and I to sit and talk about what we would like from each other at the end of the day because you are right no book can tell us that, we should be communicating with each other to know that. Now I do think a book like the five love languages can be helpful for us to decipher what our spouses needs are so we can know without always having to ask them each time. A great reminder! And I’ll join in (with my husband, well…you know what I mean). Off to Kississippi my hubby! The only rule of thumb I use when greeting my husband is a big smile and wait at least until after the kids are in bed to tell some bad news. I so wish I could get myself together before he comes home, but with all these little ones, I am lucky if I can get to the bathroom! God bless my husband. He thinks I am lovely no matter, he never comments about the house (even though we do try! )and all my food I make is “good”. This is exactly the kind of helpful and practical advice I wish I’d gotten when I first got married! Thanks for a great post today, Laura! While I do agree with this, my husband says he would like for at least the living room to be clean, and the kitchen to be “presentable” but if one or the other is not, he doesn’t complain. He understands that I am chasing our 2 and 3 1/2 year olds, and I’m pregnant. So, since he gets home about 530 everyday, I get the kids to clean up the living room, with my instruction, of course, while I am starting dinner. When they are done with what they can do, they are sent to play in their room. Thank you for that post! It alos bothers me that people give out advice on what the perfect wife should be/do. I tried to follow one of those books and it was absolutely ridiculous and it wasn’t the person my husband knows and loves. I wish those women who have fallen for this ill advice would read this post. This is absolutely great! Communication is the key. I do like to read marriage books or listen to radio programs. They have helped to realize things that I don’t need to bombard him with the bad news of the (if there is some) first thing when he gets home. Also, in reading some of these things, it can help to ask our husbands for their opinion in some of these things. Otherwise, I wouldn’t have even thought of some of them, like the above. Love your post. Thanks for some wisdom, advice and a fun new word! Love it. :) I really do need to talk to my husband about this and then strive to meet HIS ideal. ;) Apologies for typos – typing one-handed while I hold the baby. Recently, I made a list of things I do and asked my husband to tell me what was most important out of that list. I think most women would be suprised to see that often what we think is important to him, is actually not. When I first got married, I read all sorts of Christian marriage books. I was upset and confused when my husband didn’t respond positively to any of the advice in the books. I got so frustrated that he didn’t fit the “mold,” thereby making is more difficult for me to figure out how to be a good wife. He finally said, “Honey, instead of reading those books, why not just ask me what I need?” Oh. Heh. Hadn’t thought of that! So true!!!! Thanks for this post – it extends so much grace when many Christian books (well-meaning, I know) don’t offer grace. I love the Kississippi! You always crack me up and brighten my day. Thank you!!! Wow – that is totally not our routine! It definately is all about the kids. Their favorite game is to hide when my husband gets home so that he can find them. They would get quite impatient if I detained him with a 60 second kiss! Hmmm, I might try it though! I just talked to my husband about this last night! How did you know?? We’d both been getting frustrated with each other in the evenings, and discovered that we just hadn’t communicated about what we need! Now he’s going to get to relax for the first hour he comes home, with our 2 little girls sitting one his lap (his favorite thing!). This makes him happy and frees me up to make dinner without babies underfoot! When the girls go to bed I get to vent to him about how the 2 year old wouldn’t stay in bed for a nap, and how said 2 year old woke up the baby with her yelling about not staying in bed and my perfectly splendid day was ruined. :) I think it will be better this way anyway, because if I wait until the girls go to bed we get to actually talk and pray about anything that’s gone wrong. Great advice!! Thanks! !